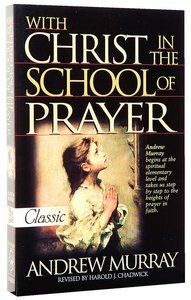 Since Andrew Murray published this book in 1885, hundreds-of-thousands have agreed with him that no one can teach prayer better than Jesus Christ. This enduring classic will transform your prayers and life if you'll open your heart to the prayer-lessons Jesus gave. "The Father waits to hear every prayer of faith. He wants to give us whatever we ask for in Jesus' name. If there is one thing I think the Church needs to learn, it is that God intends prayer to have an answer, and that we have not yet fully conceived of what God will do for us if we believe that our prayers will be heard. God hears prayer." (Andrew Murray). About "With Christ in the School of Prayer (Pure Gold Classics Series)"
Prepare yourself for one of the church's most important ministries---intercessory prayer. Using Jesus' teaching on prayer as a model, Murray begins at the elementary level and then leads you step-by-step deeper into the holiness of God. This special revised edition includes a timeline tracing Christian and secular history, and a brief illustrated biography of Murray. Expounds Christ's teachings on the secret of believing in prayer, the certainty of answered prayer, the power of prevailing prayer and the chief end of payer. Customer Reviews For "With Christ in the School of Prayer (Pure Gold Classics Series)"
This is one of the best books I've read on prayer! I found some of Andrew Murray's other works a little hard to follow, but not this one. It is straight to the point and contains great encouragements for the realm of prayer, and is easy to read. Murray specifically encourages Christians to pray and EXPECT answers to prayer rather than praying in a vague or unbelieving manner. I first read this book in 1997 and have almost completed it a second time this year (2017). I highly recommend it for every Christian who wants to develop as a man or woman of prayer. After E.M. Bounds I'd rate Murray as the author on prayer who has impacted me the most.